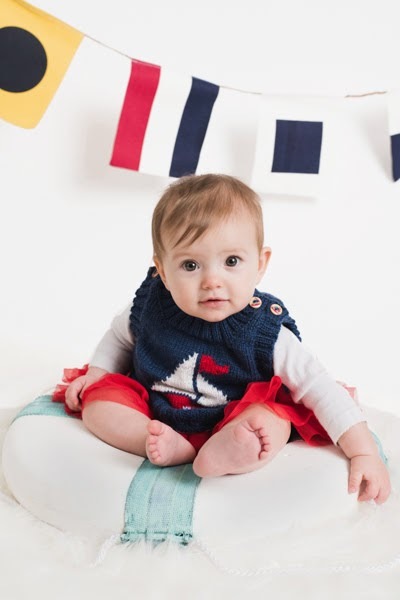 Spring is finally starting to emerge, and here's a new pattern that is perfect for the new season, my Little Sailor Baby vest. 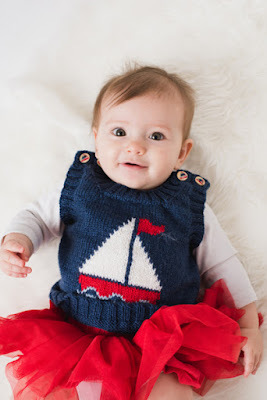 The Little Sailor vest is a baby vest featuring a traditional sailing boat. The vest is inspired by vintage clothing, and is the perfect traditional item for a baby's wardrobe. The vest is knitted from the bottom up in pieces. 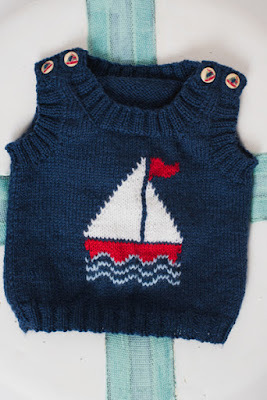 The boat is knitted on a stocking stitch background using the intarsia technique. The hem, armholes and necklines are knitted using 2x2 rib and the armholes and necklines are picked up and knitted after the garment has been seamed. The shoulders are fastened using buttons to allow for easy dressing. The vest is designed to fit ages 3 months to 2 years, with 2 inches positive ease. Sizing details are shown in the schematic. The sample is knitted in Bergere de France Ideal,* a hard-wearing sport-weight blend of acrylic, polyamide and wool, which is machine washable, making it a perfect yarn for knitting baby gifts. The pattern is in the latest issue (April 2018) of I Like Knitting magazine, an e-zine available via a subscription model. If you want to find out more, click here. * The issue is full of gorgeous things to knit, with sections for both Easter and nautical-inspired designs. If you want to favourite the pattern or add it to your Ravelry queue, you can find the pattern page here. All images copyright I Like Knitting.